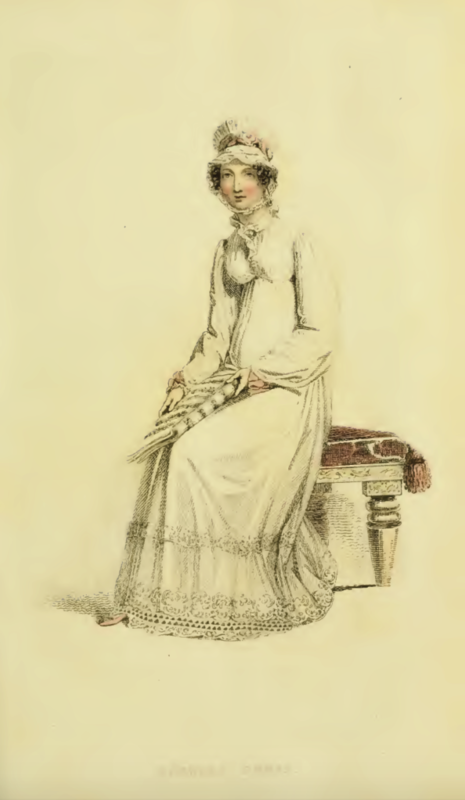 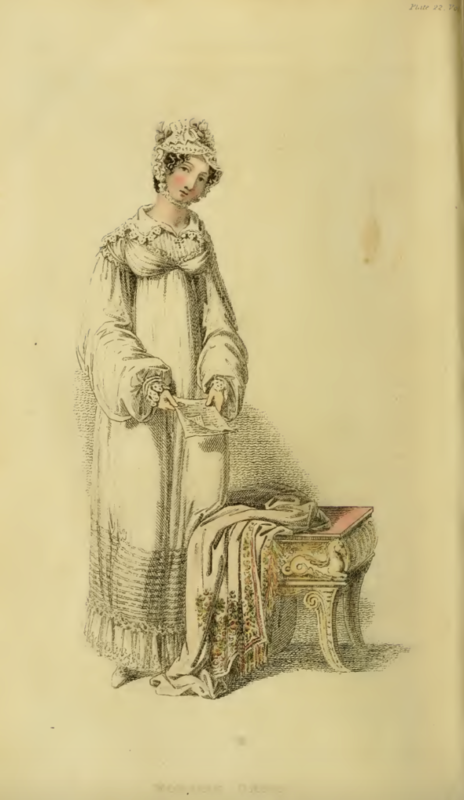 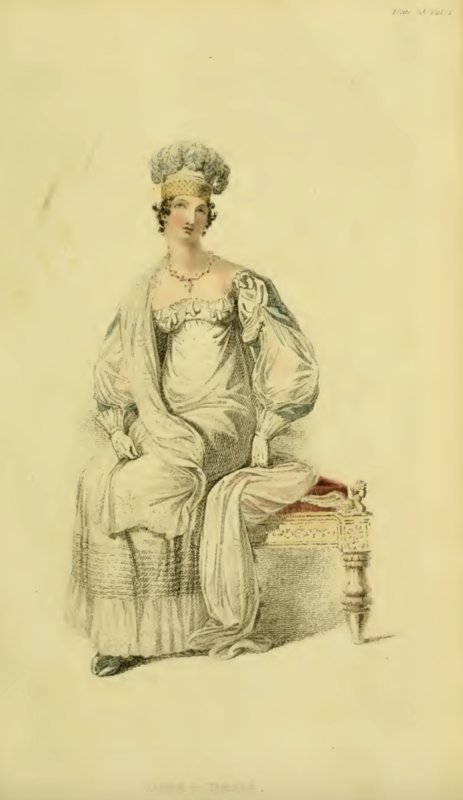 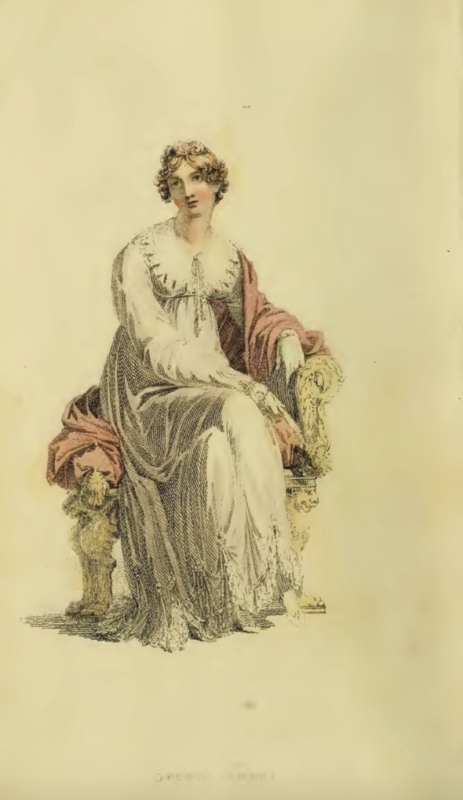 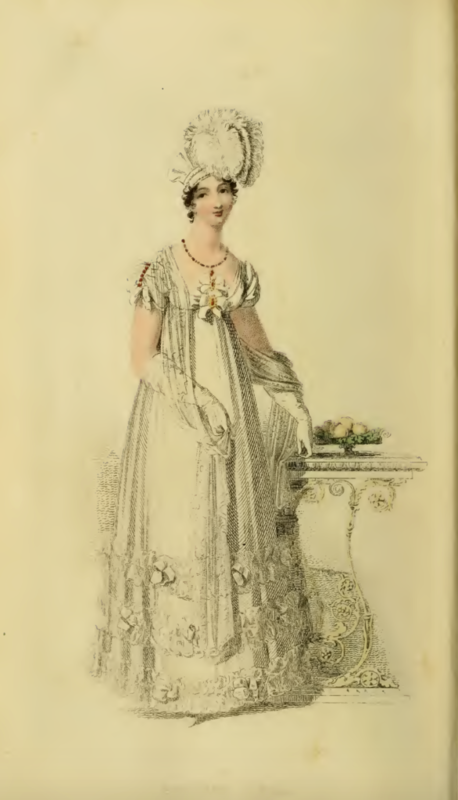 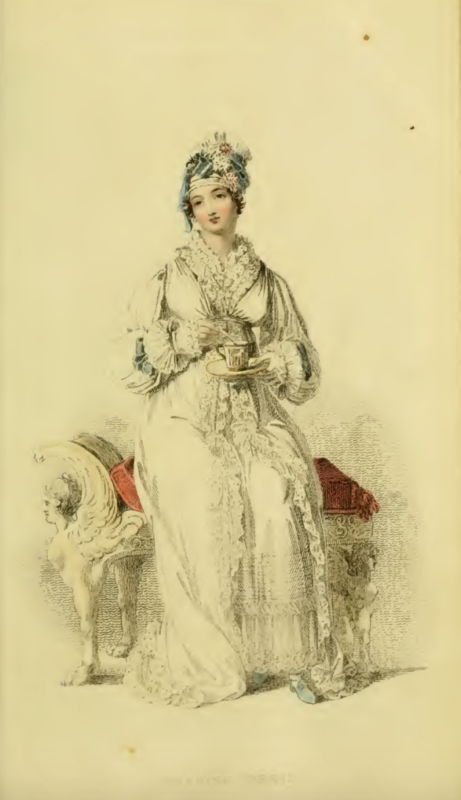 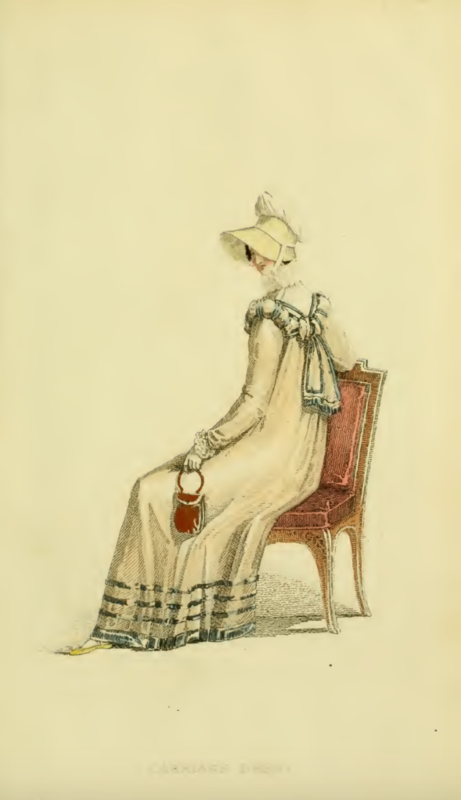 January 1817’s fashion plates focus on French fashions: a full dress made for the Duchess de Berri, and a plate of hats of Parisian design. 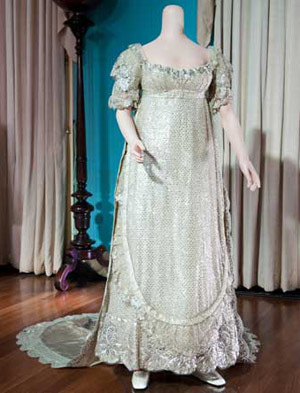 The Duchess’s court dress features an open robe (of British net!) 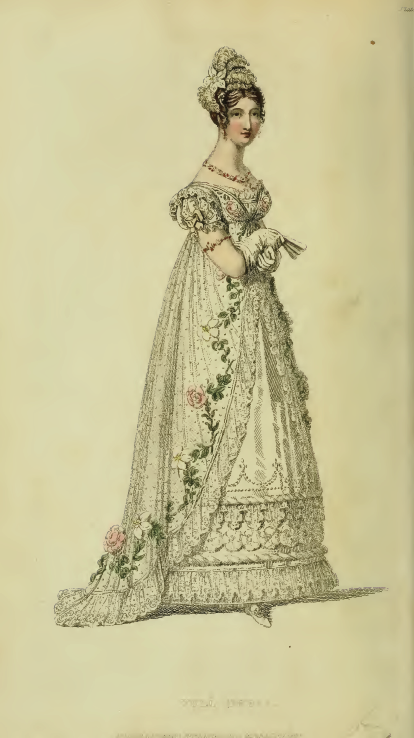 trimmed with blond lace and adorned with intermingled lilies and roses. 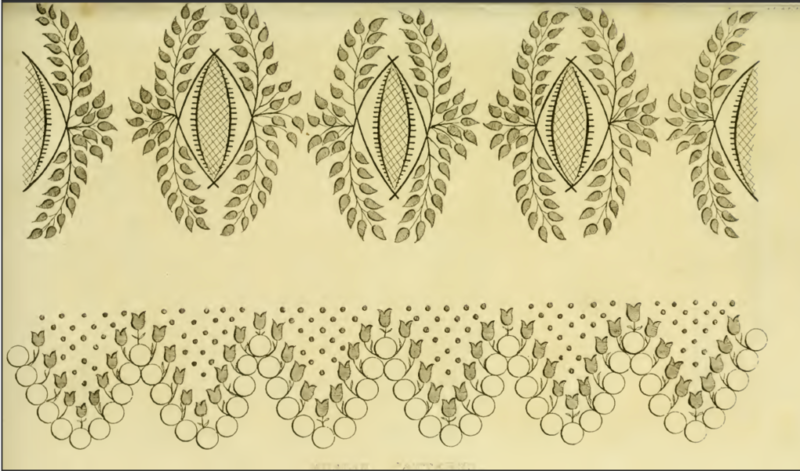 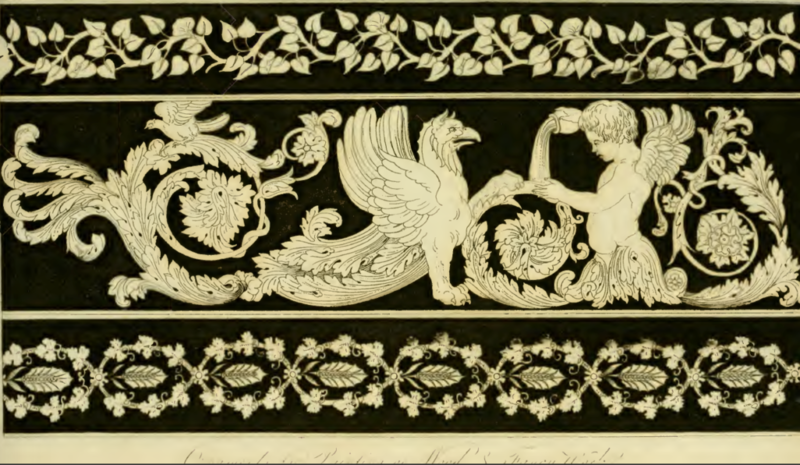 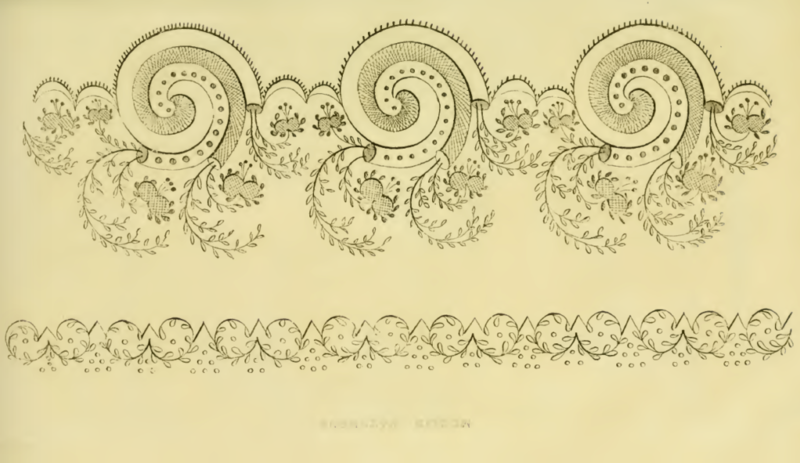 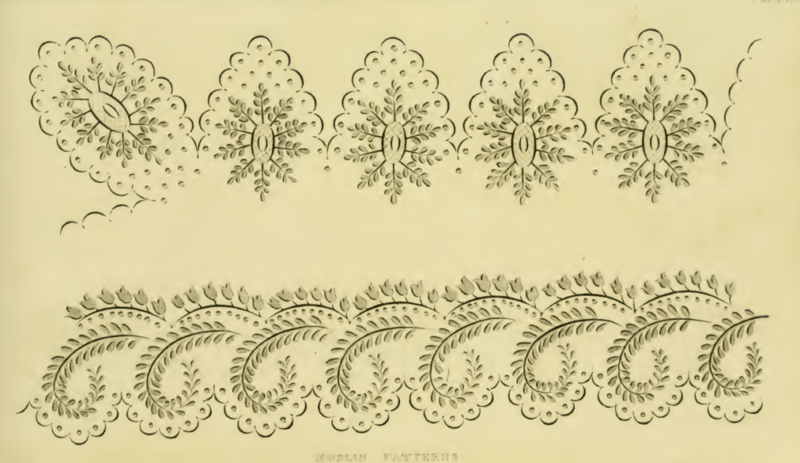 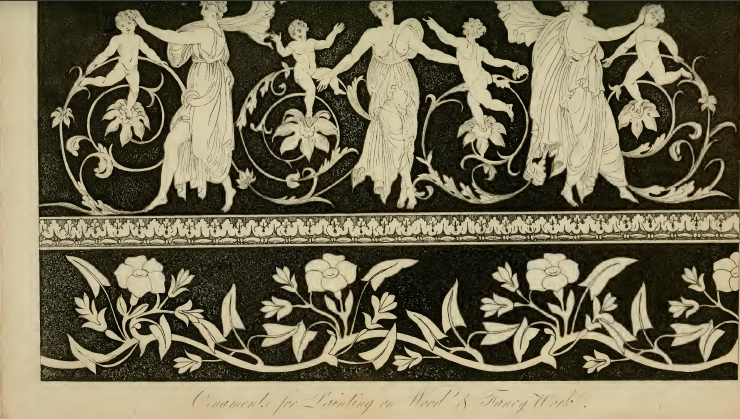 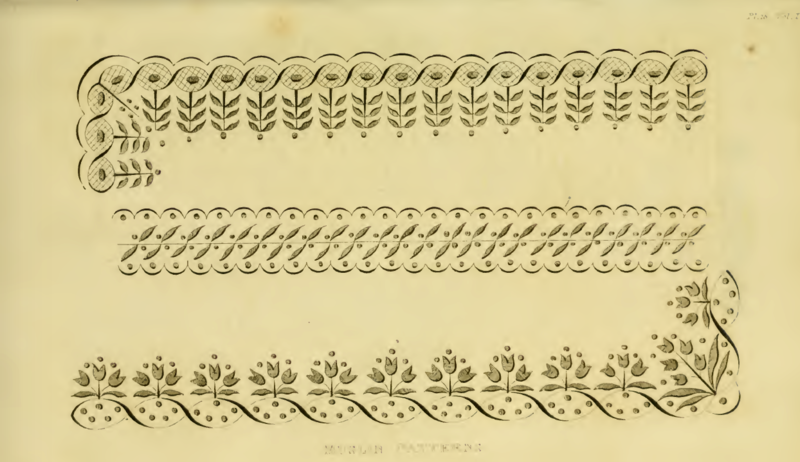 The underlying white satin slip features five rows of trimming: two satin twisted rolls; a wide wreath of lilies of plain blond; a deep flounce of blond lace; and a waves of lily stalks, surmounted by what appear to be fleur de lis. 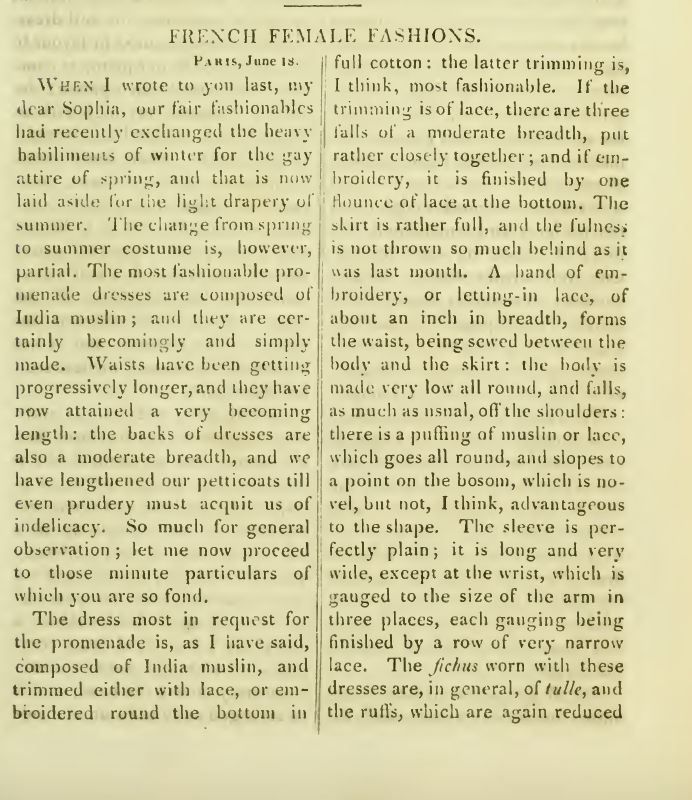 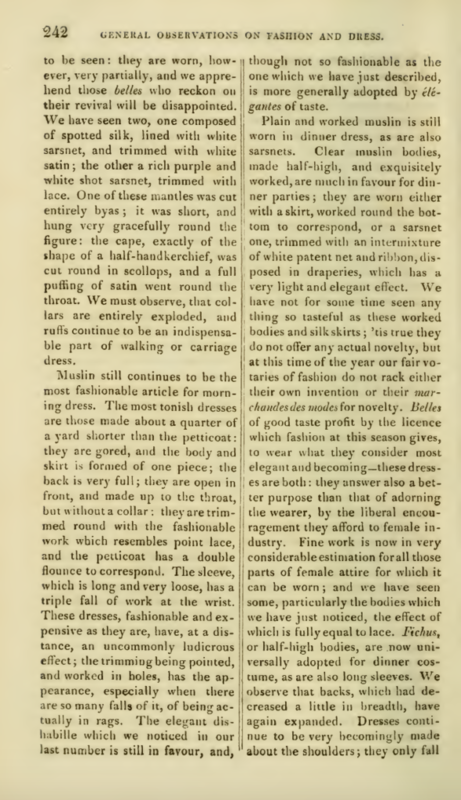 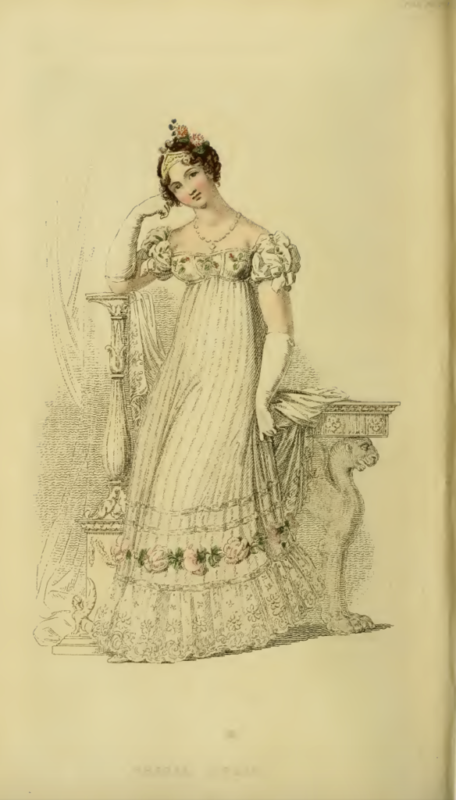 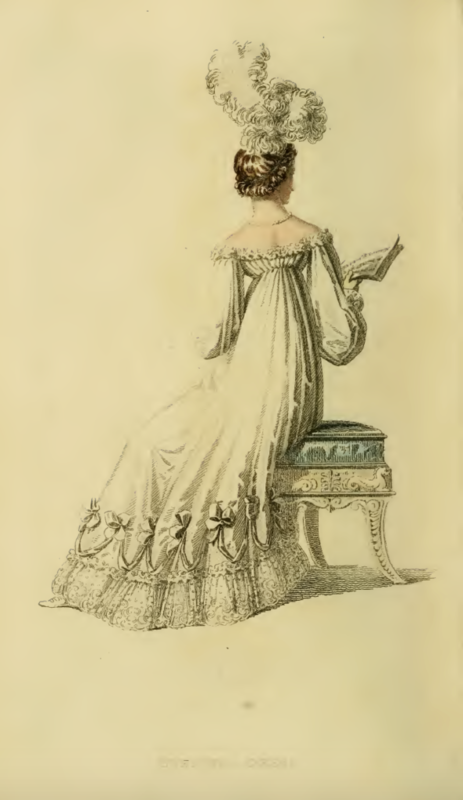 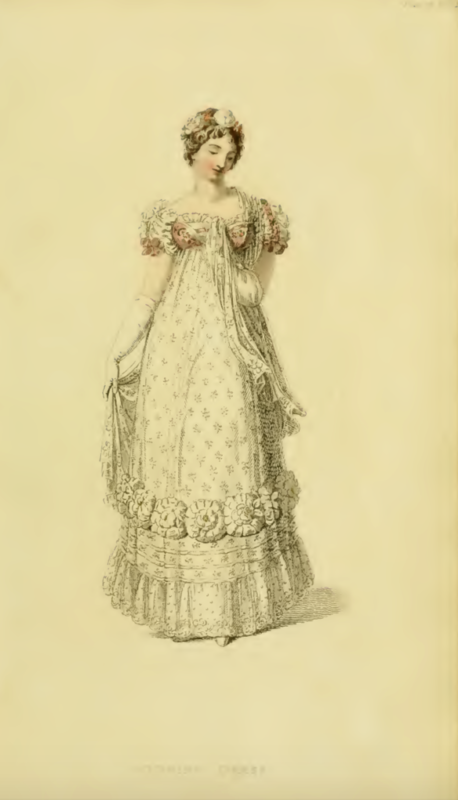 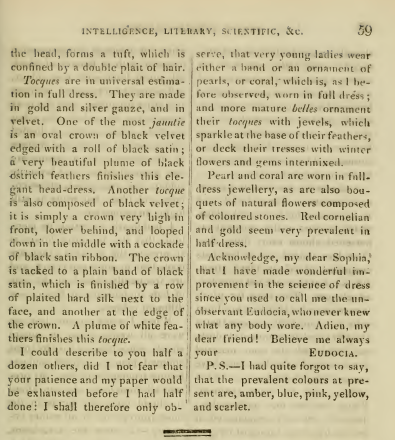 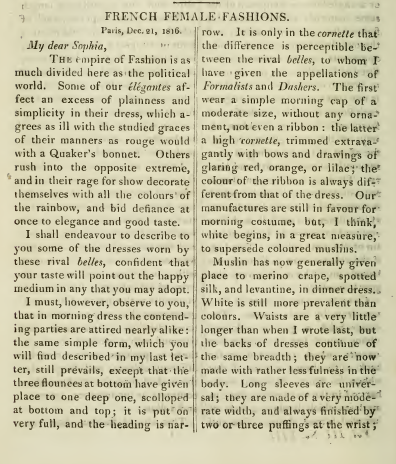 Ackermann’s fashion writer of late has taken to referring readers “to the print” rather than to actually describing the bodices of the gowns featured; a sign of growing social delicacy, perhaps? 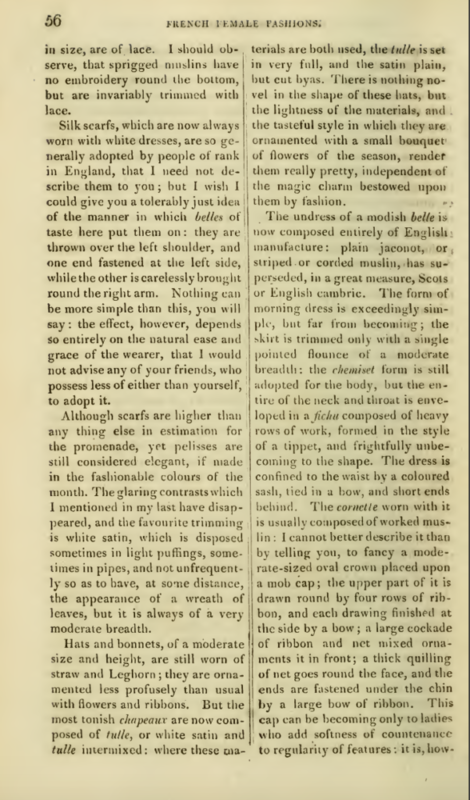 Or just a lack of sewing knowledge on the part of the correspondent? 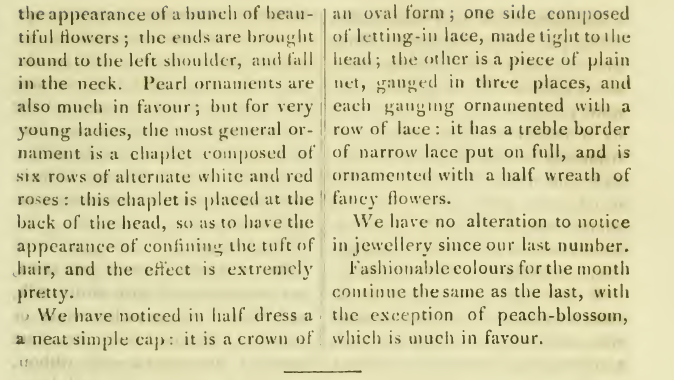 Rubies intermixed with pearl are the jewels of choice here, including necklace, earrings, bracelets, and armlets. 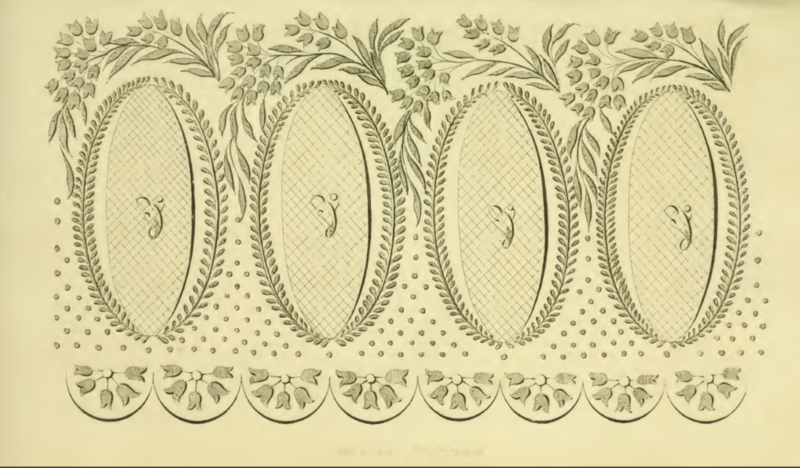 The lady’s headdress is said to be “a single lily, placed in a bunch of fern,” although the fern here looks to be of the feathered variety. 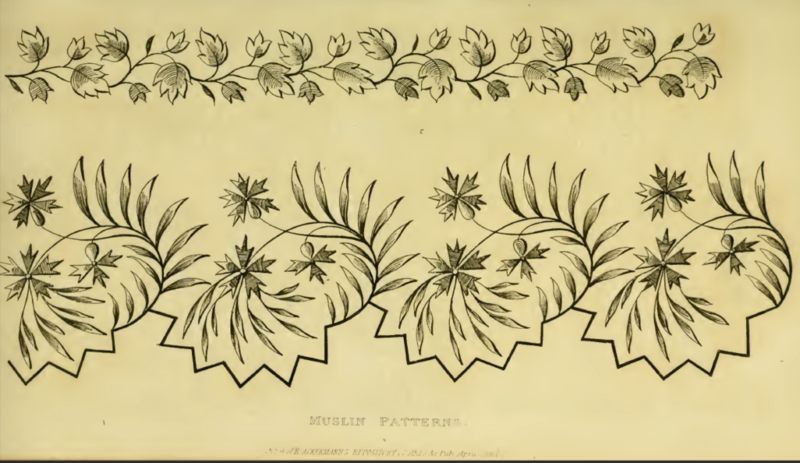 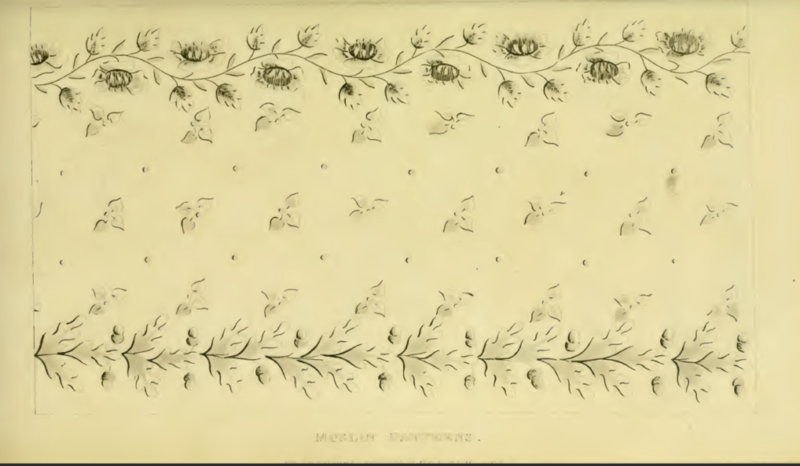 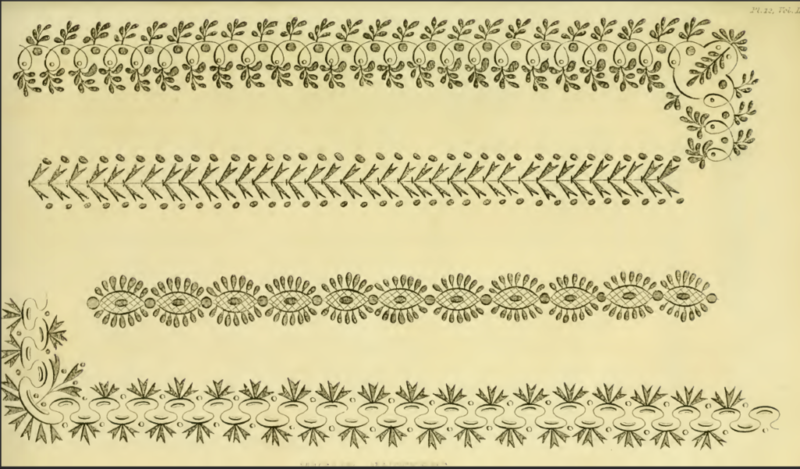 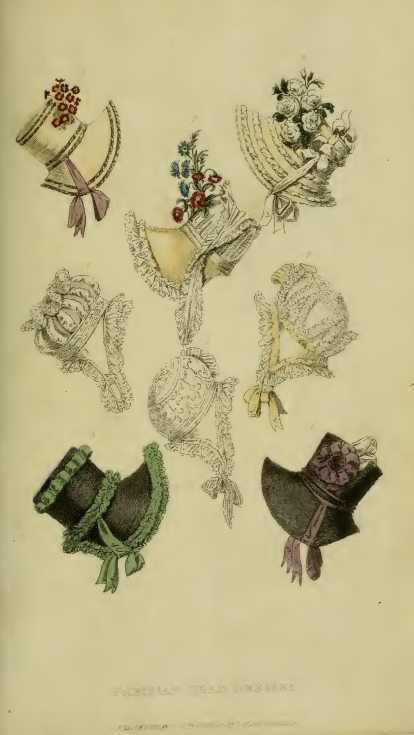 Each of the hats below are “furnished… from one of the first houses in Paris.” The similarities amongst them suggest that stylish misses wore their bonnets with large crowns, as well as deep fronts, and that floral decorations were the most in favor—auriculas, white roses, China asters, Provence roses, and unspecified “fancy flowers.” Straw in natural shades, or in black, dominate. 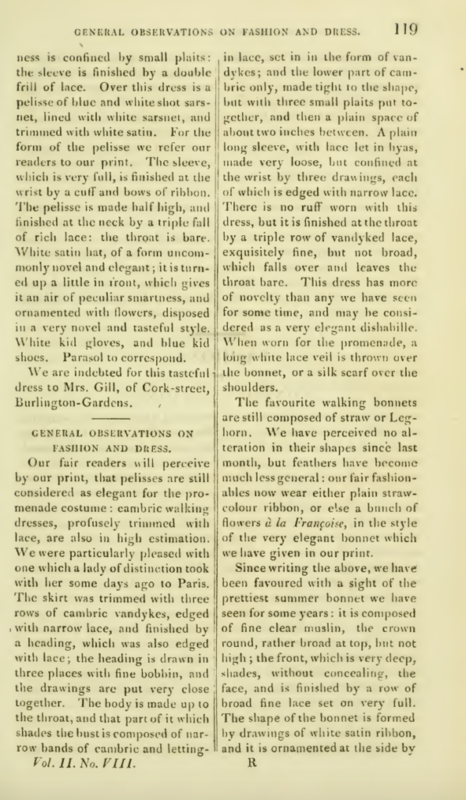 January’s issue includes the quarterly report of fashions from Paris, where the sartorial trends are as mixed as are the country’s politics. 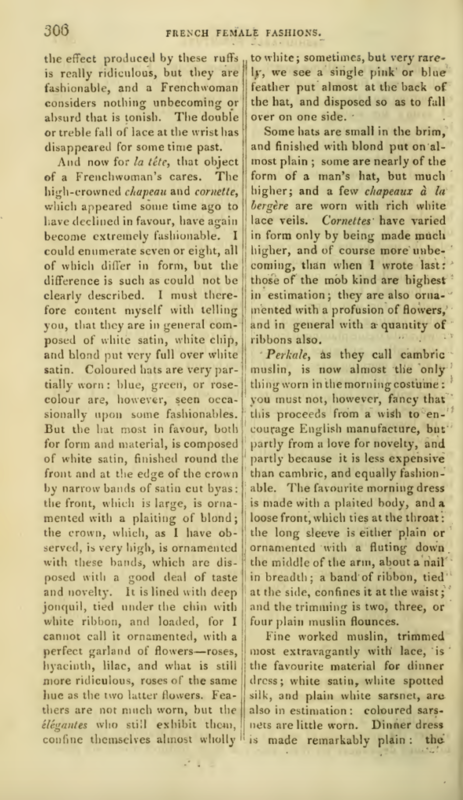 As our correspondent reports, “Some of our élégantes affect and excess of plainness and simplicity in their dress, which agrees as ill with the studied graces of their manners as rouge would with a Quaker’s bonnet. 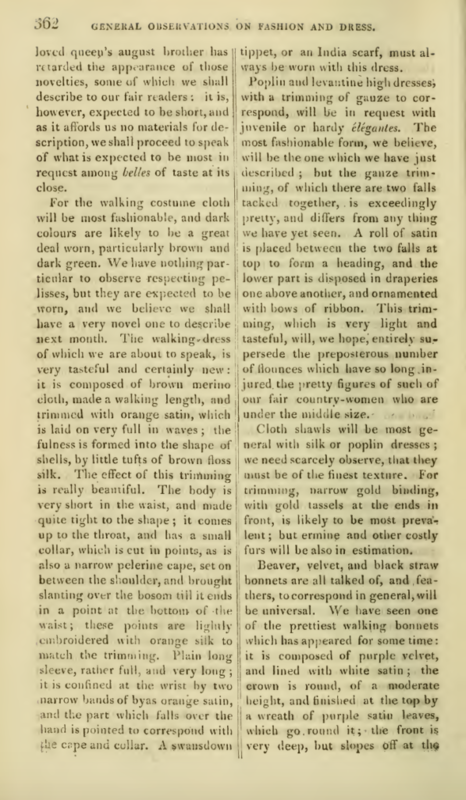 Others rush into the opposite extreme, and in their age for show decorate themselves with all the colours of the rainbow, and bird defiance at once to elegance and good taste.” Our correspondent christens the two groups Formalists and Dashers. 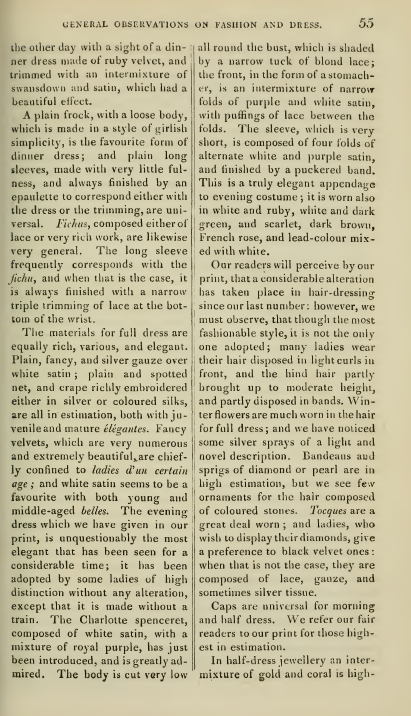 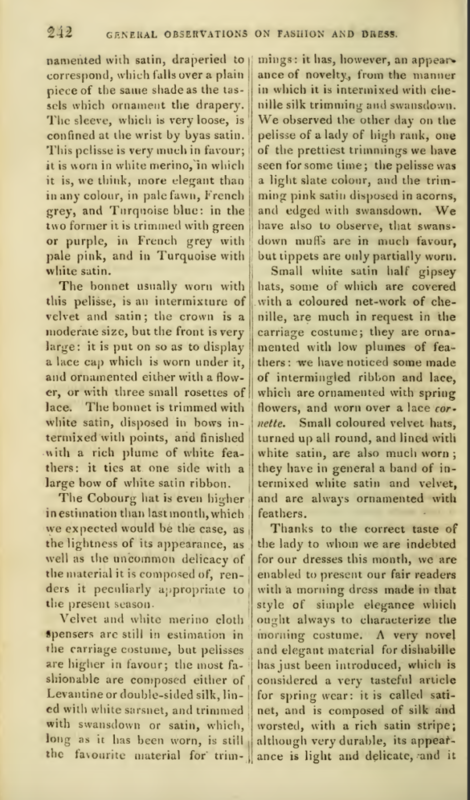 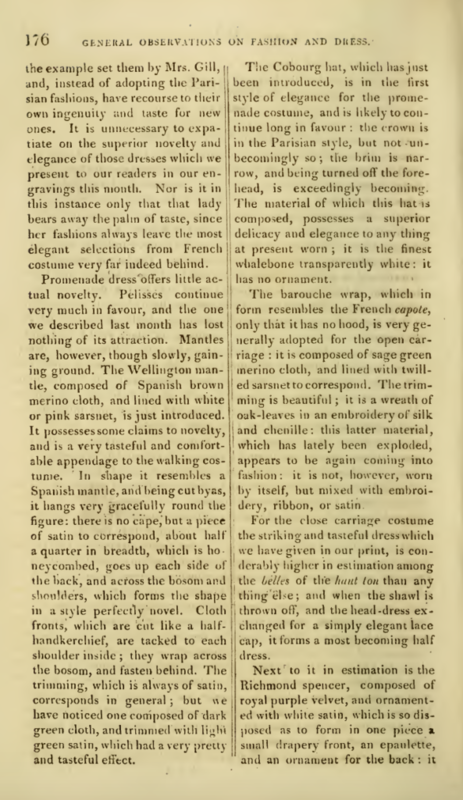 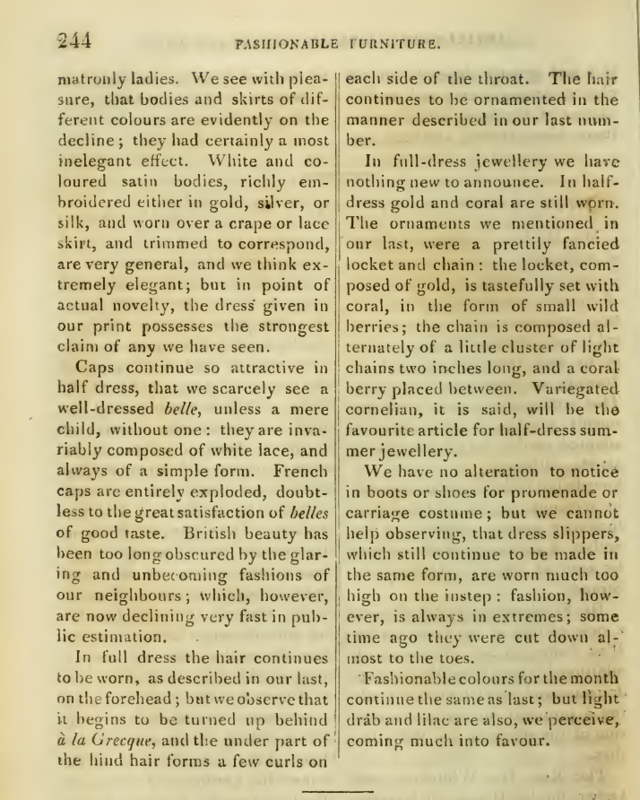 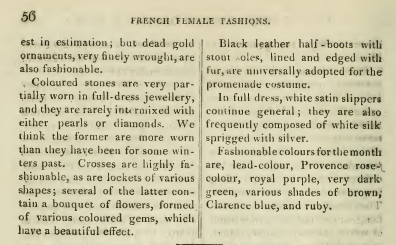 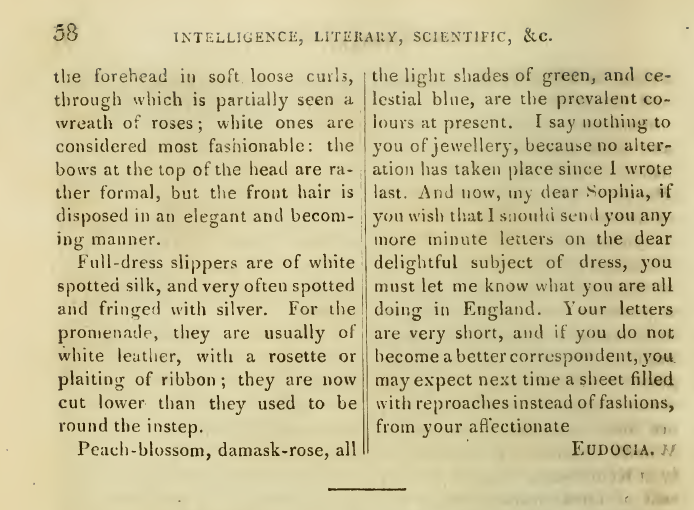 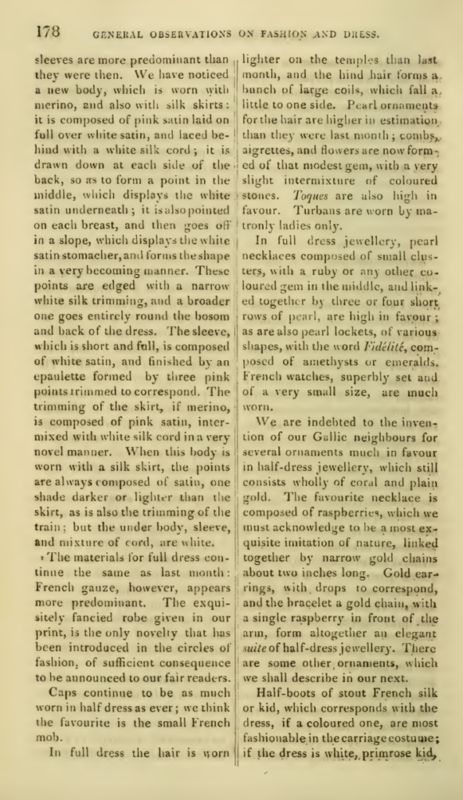 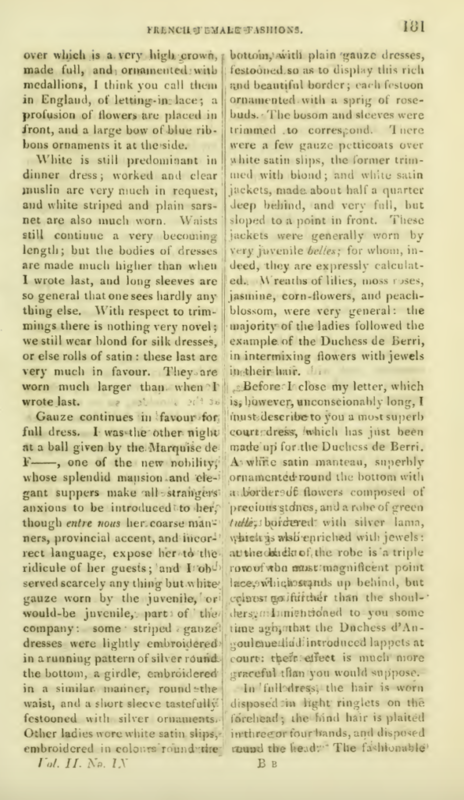 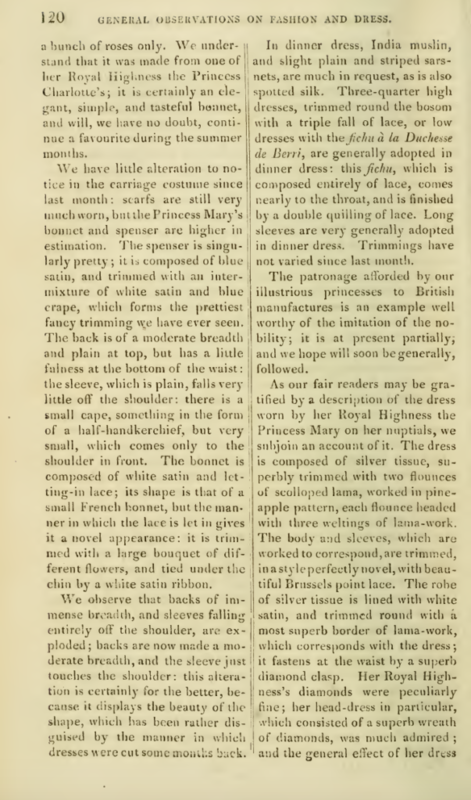 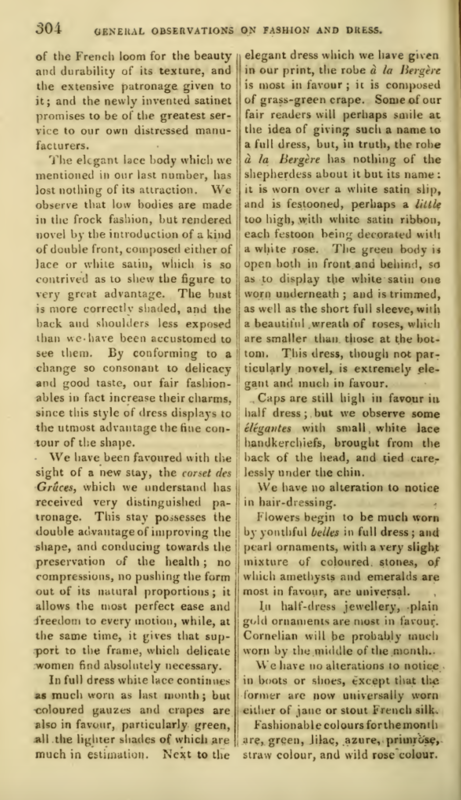 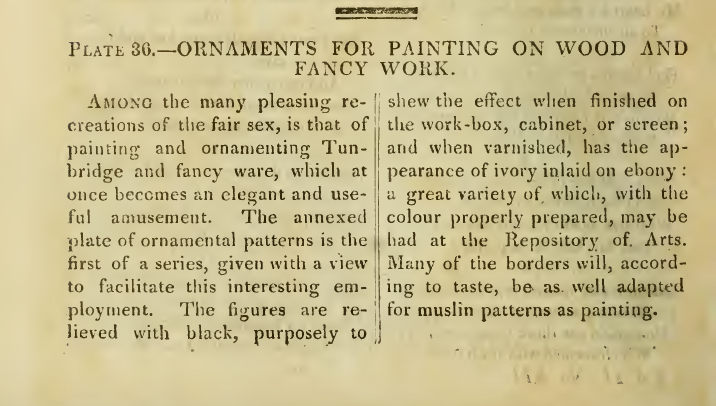 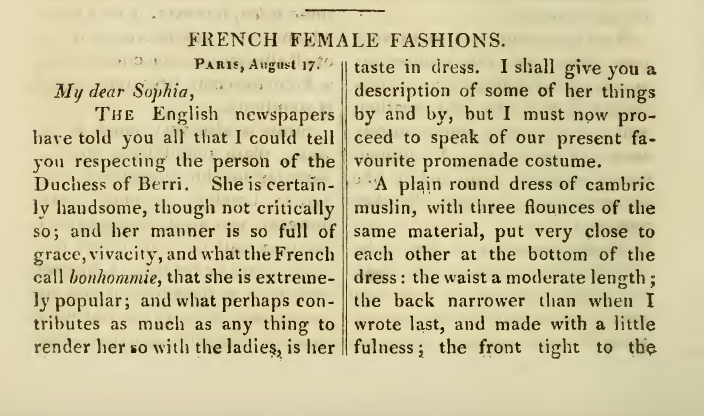 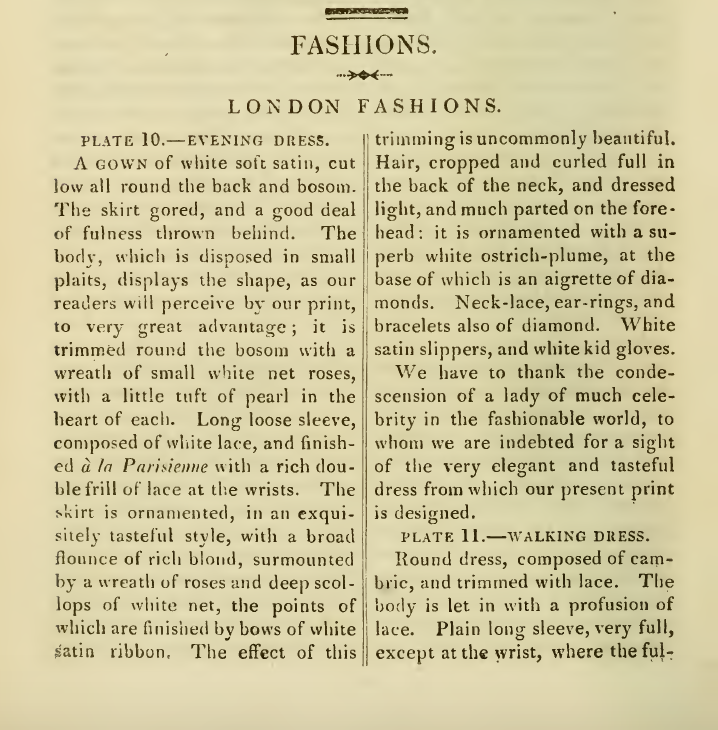 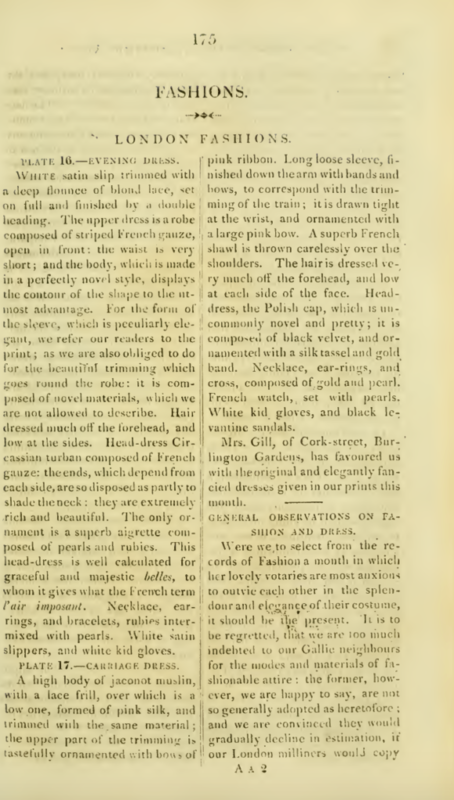 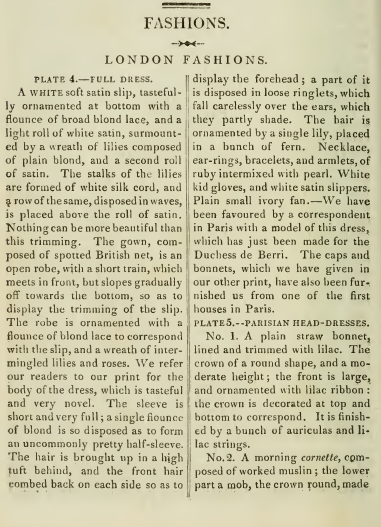 Of course, a British woman’s taste “will point out the happy medium” amongst the descriptions of the melange of gowns that follow. 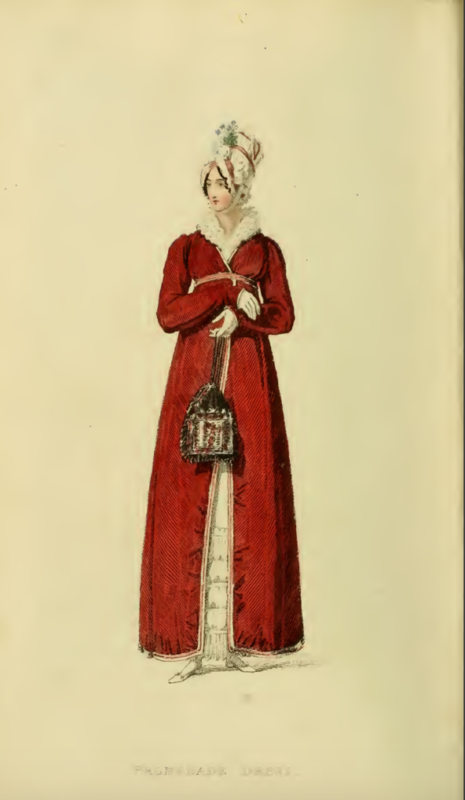 Seemingly, the form of the gowns worn by each group are similar. 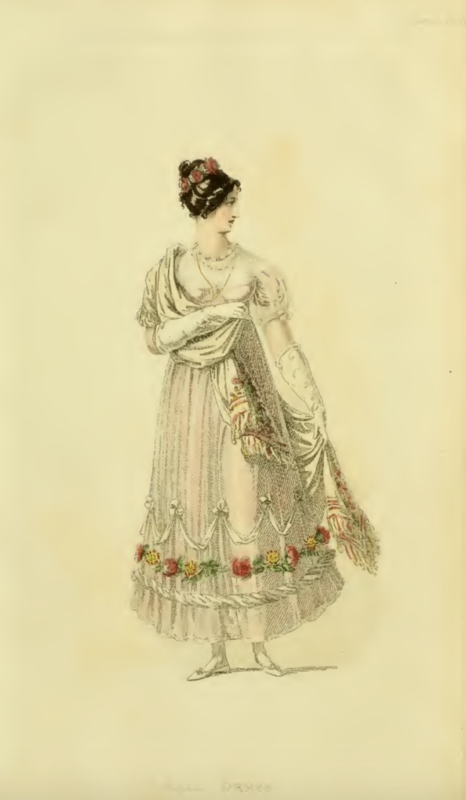 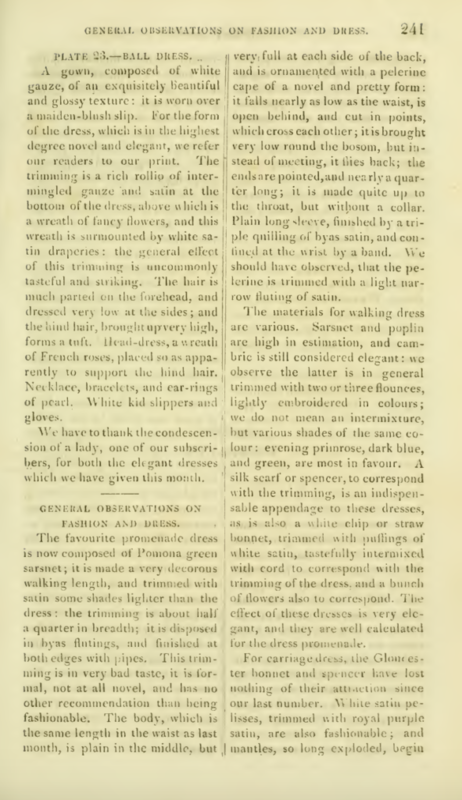 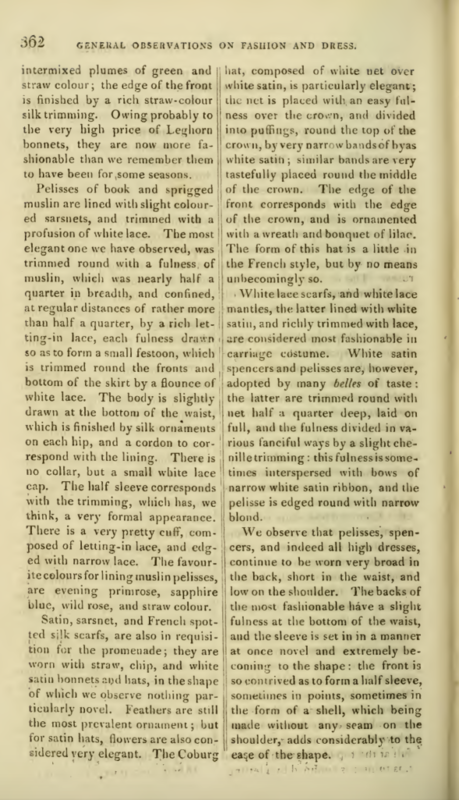 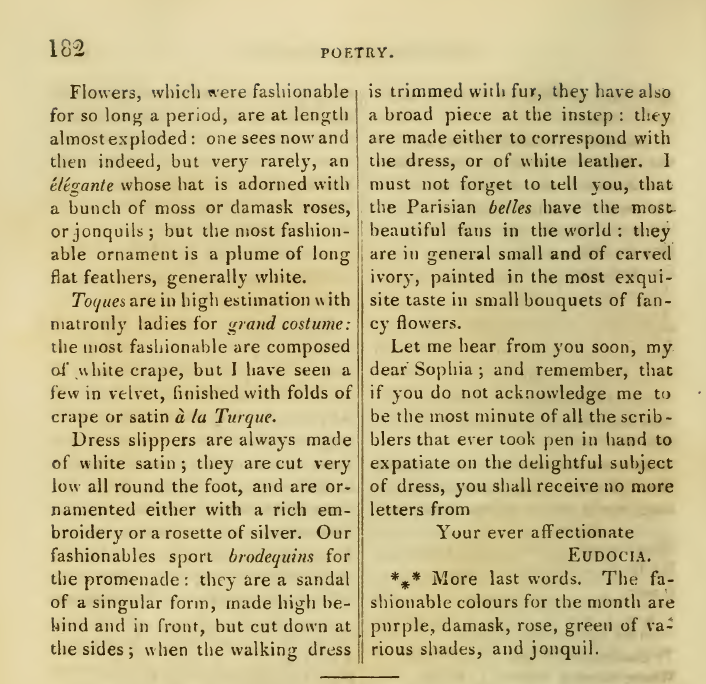 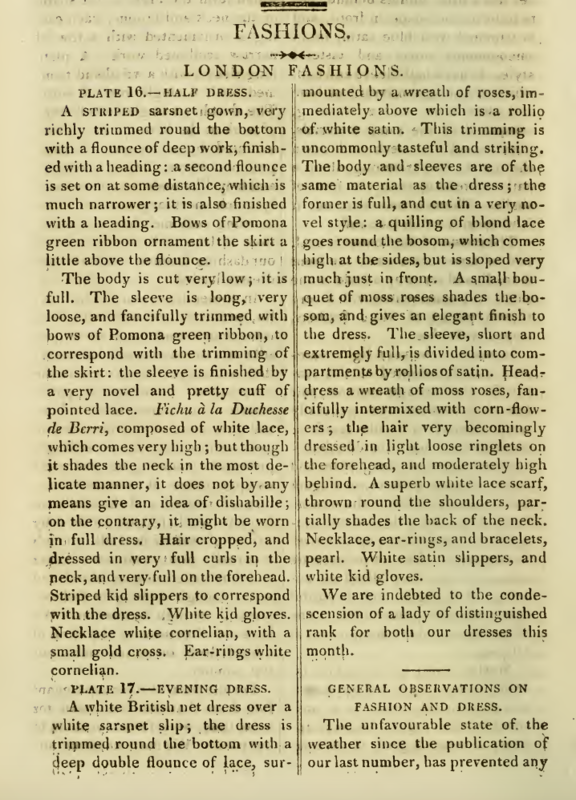 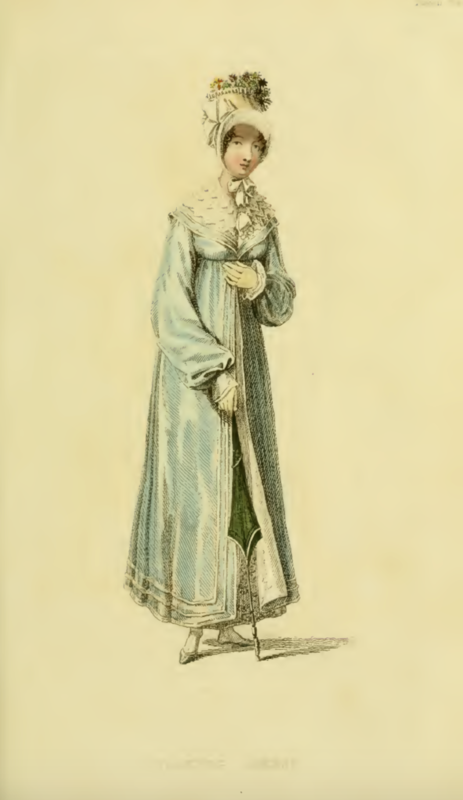 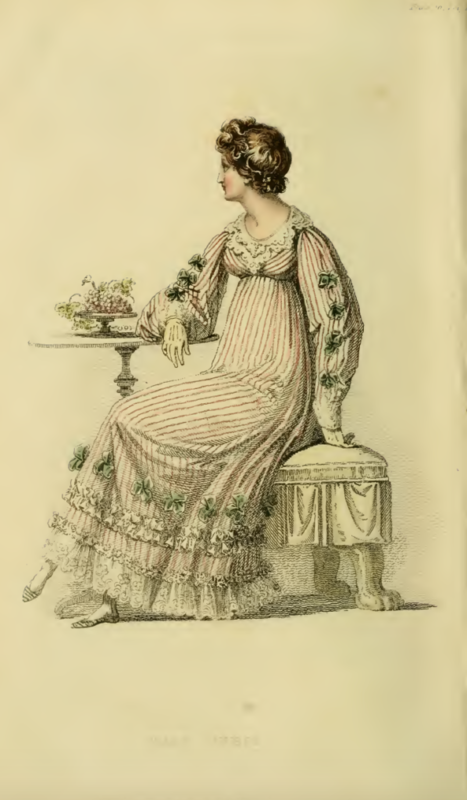 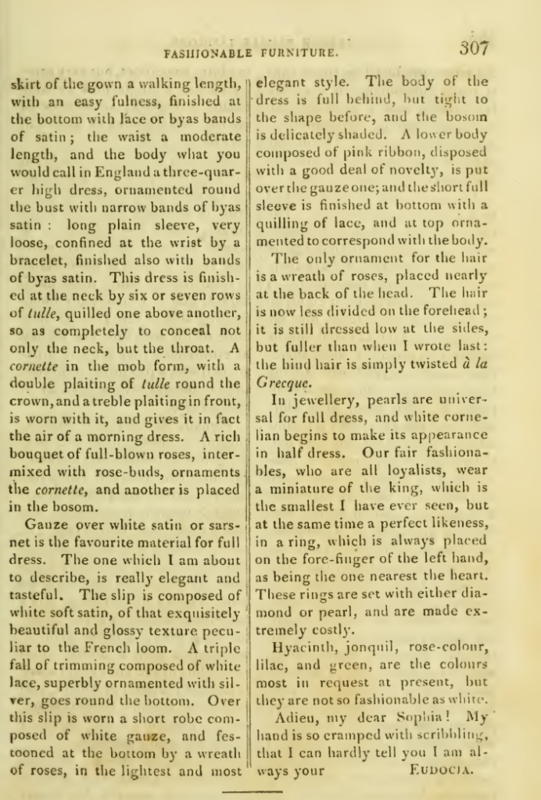 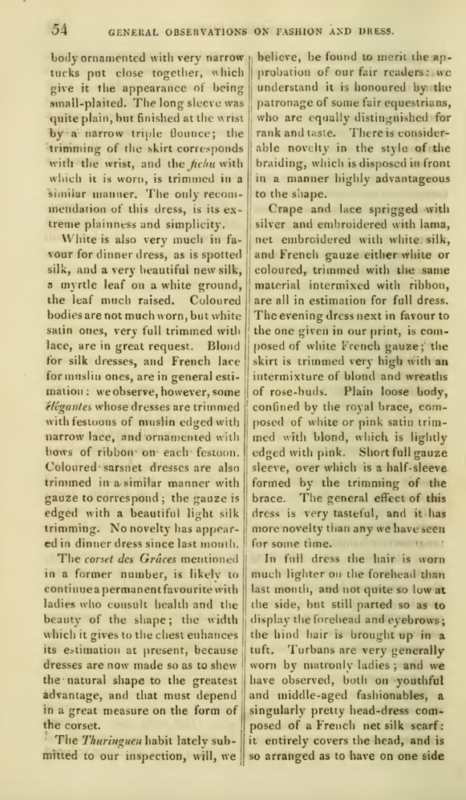 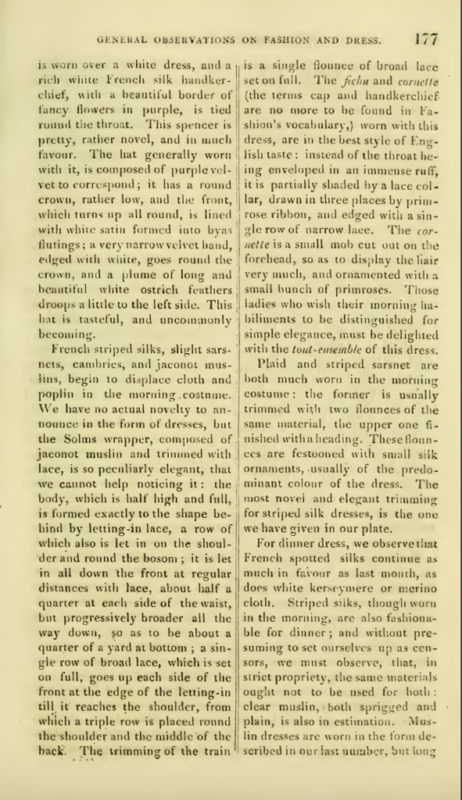 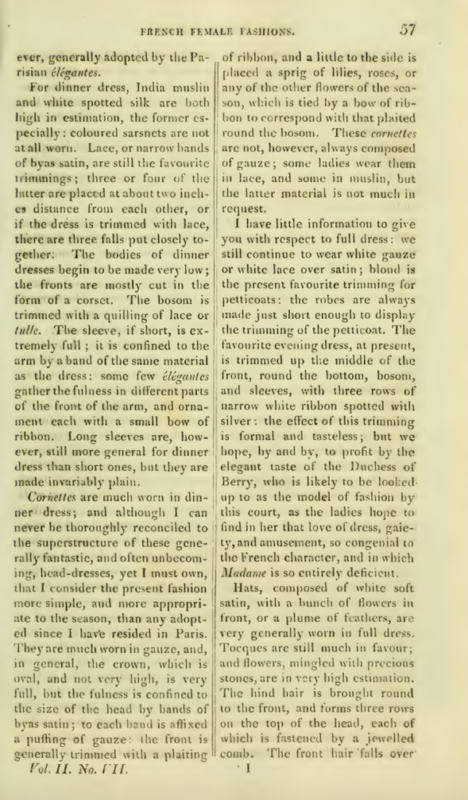 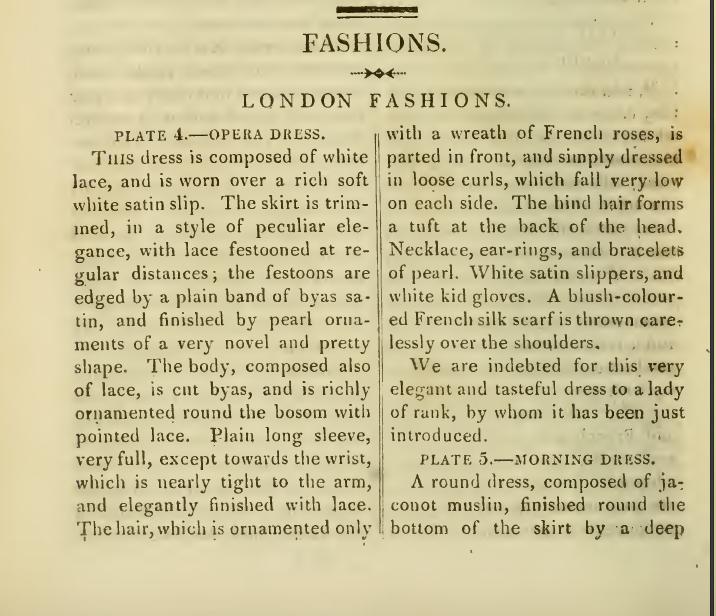 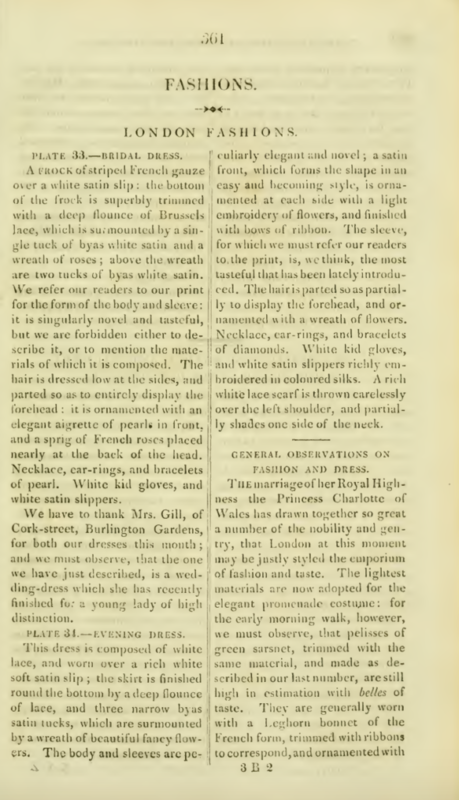 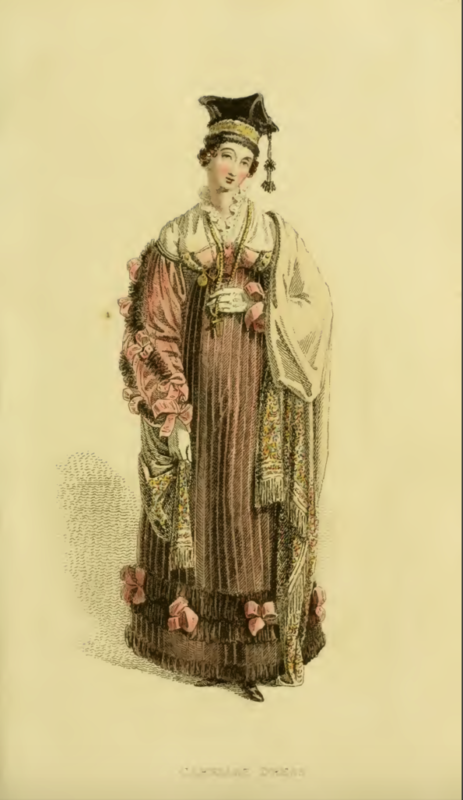 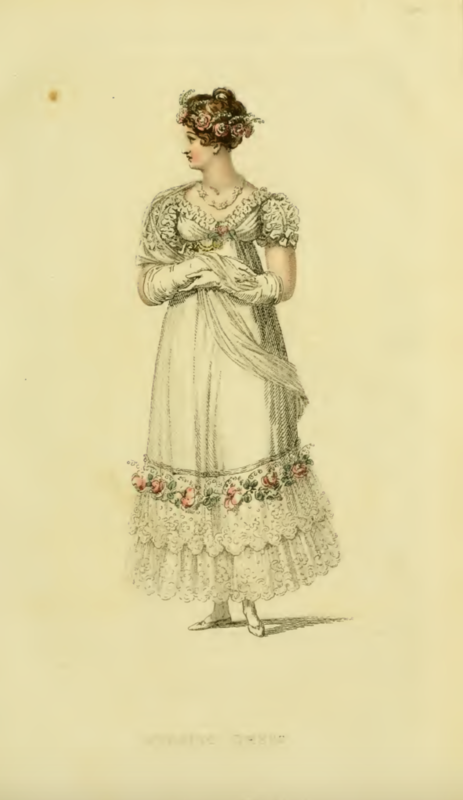 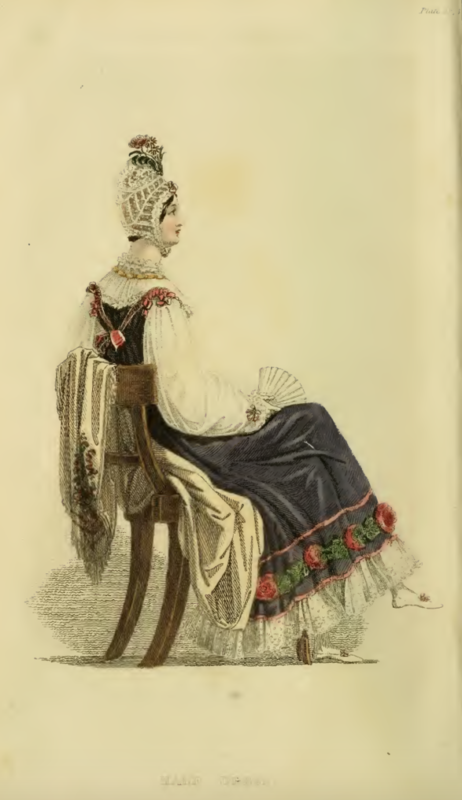 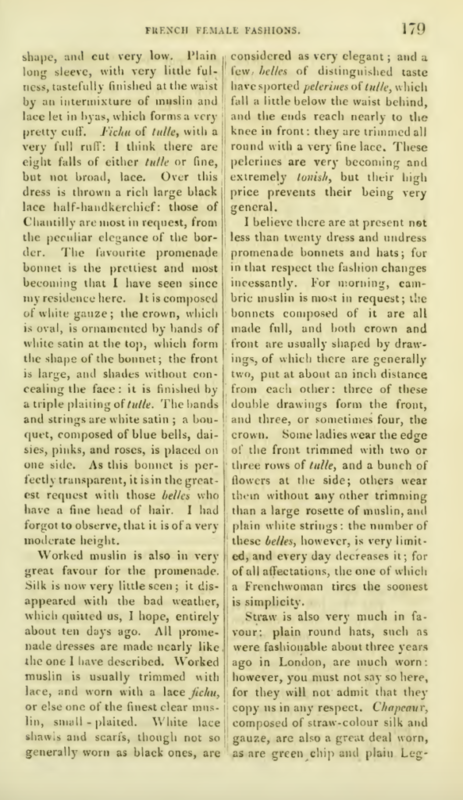 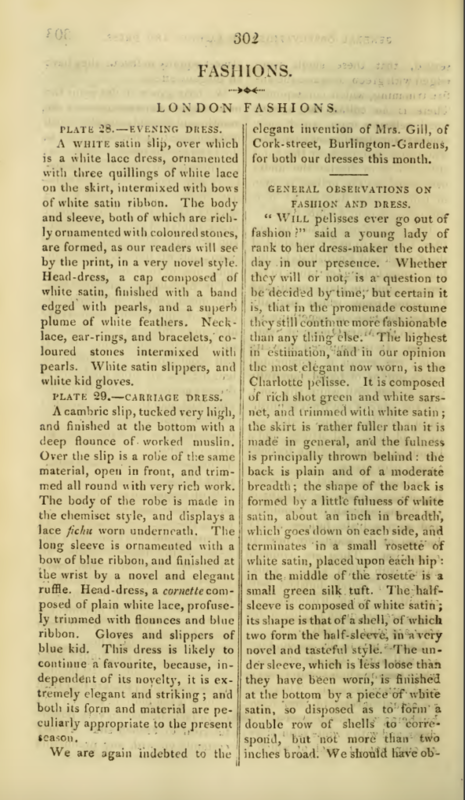 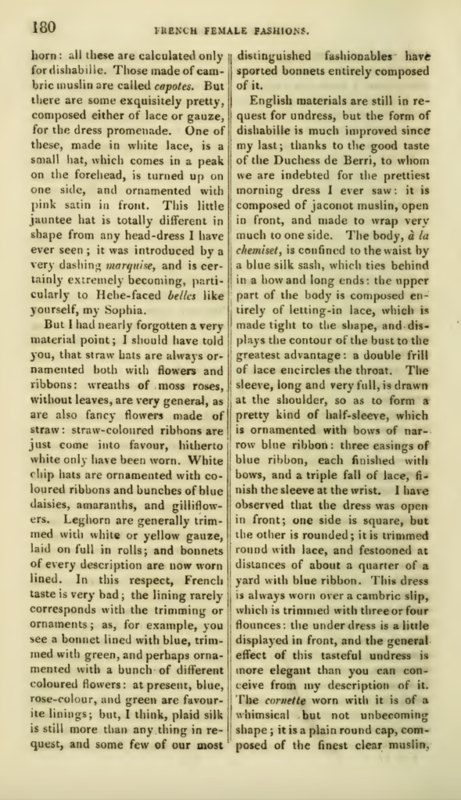 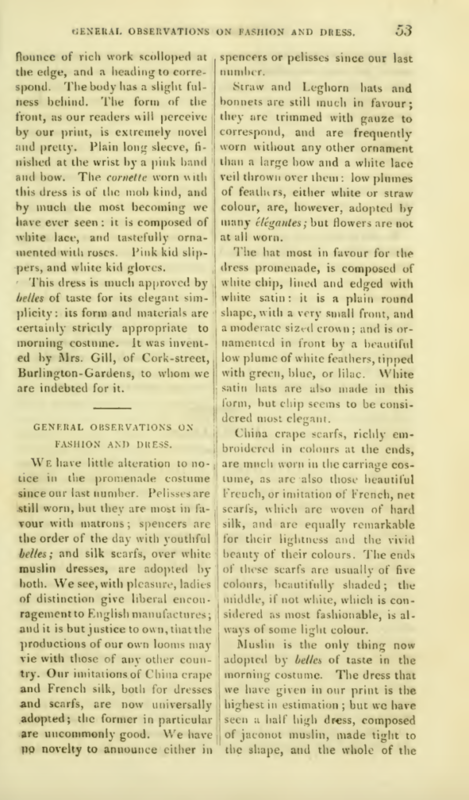 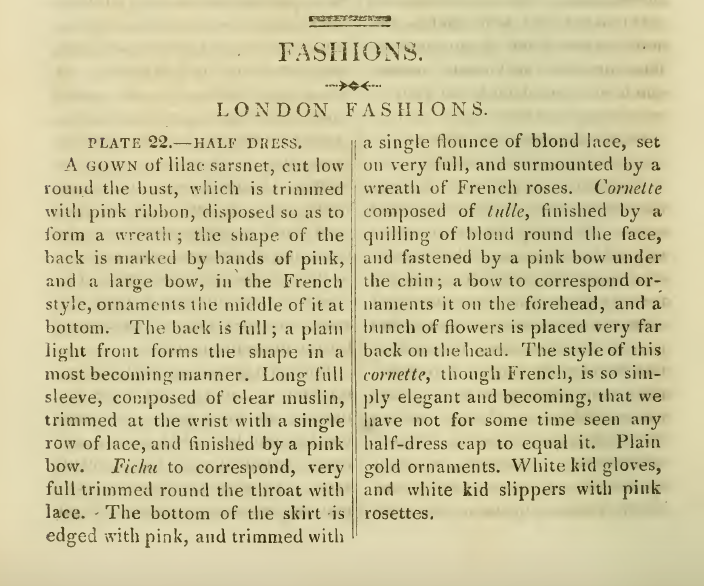 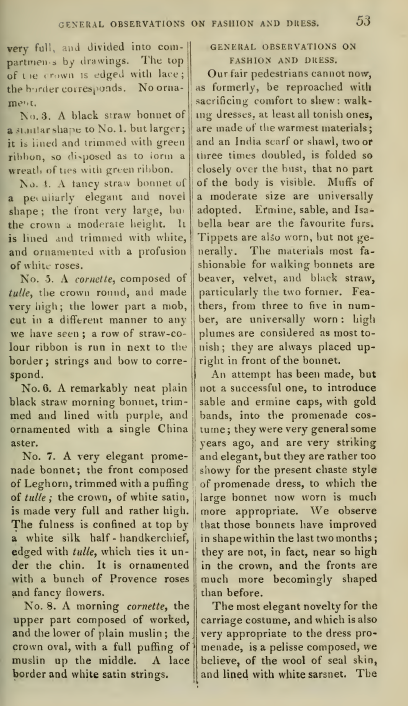 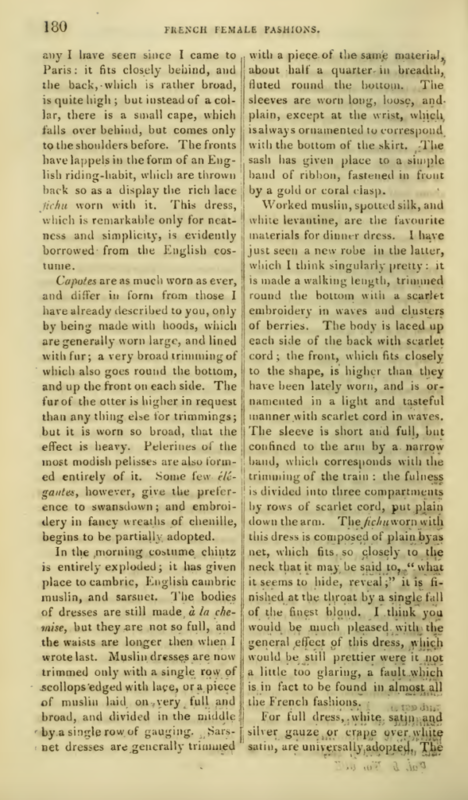 In day dress, the only real difference is in the cornette: formalists wear “a simple morning cap of a moderate size, without any ornament, not even a ribbon,” while dashers don “a high cornette, trimmed extravagantly with bows and drawings of glaring red orange or lilac; the colour of the ribbon is always different from that of the dress.” In dinner dress, it is the trimmings on the gowns themselves that differentiated the two groups. 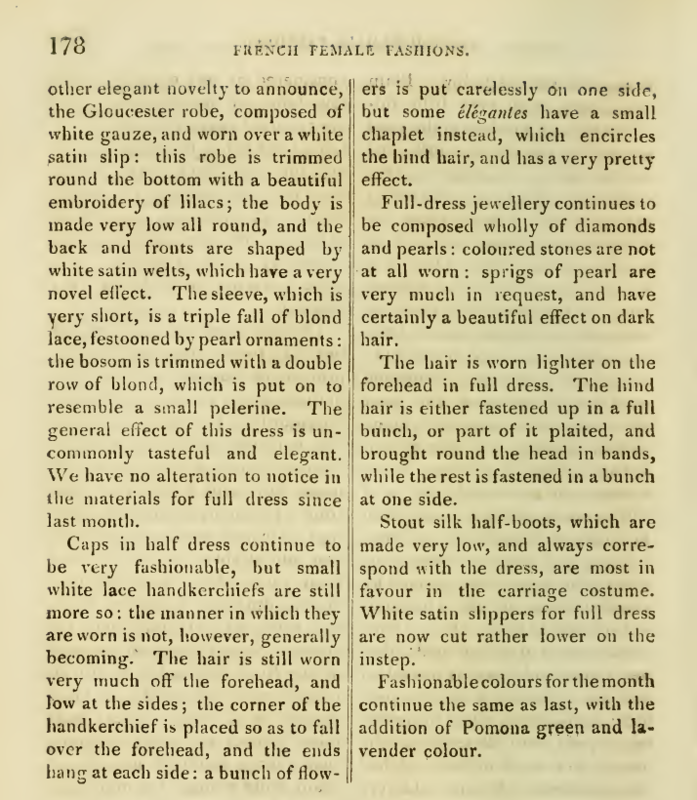 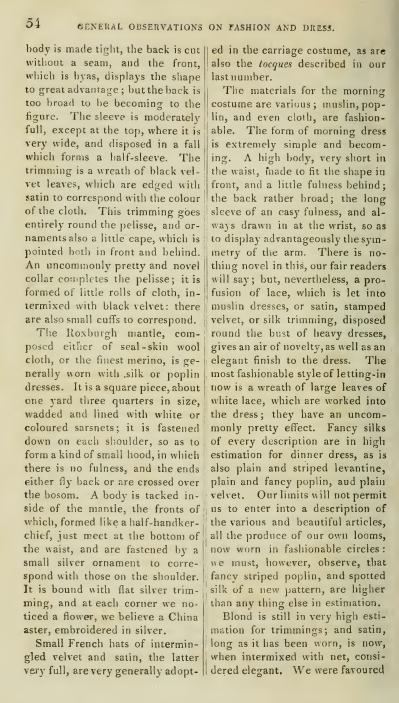 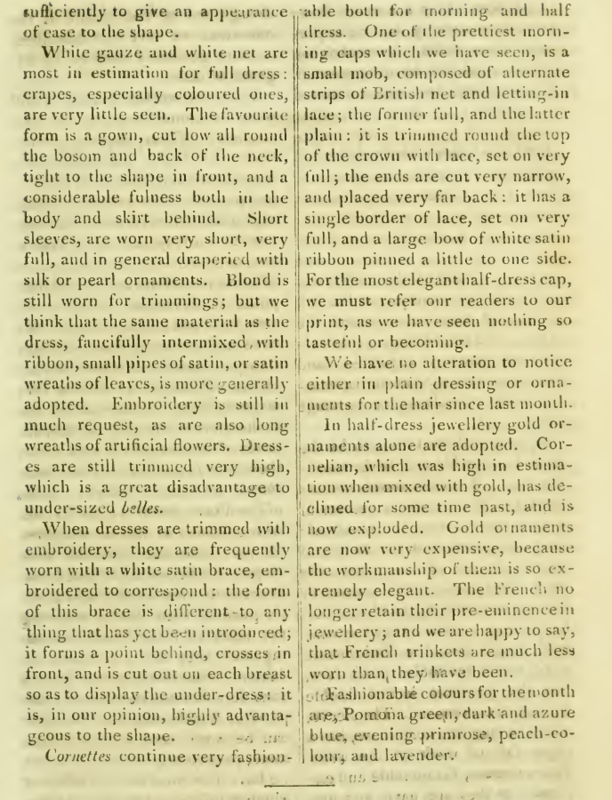 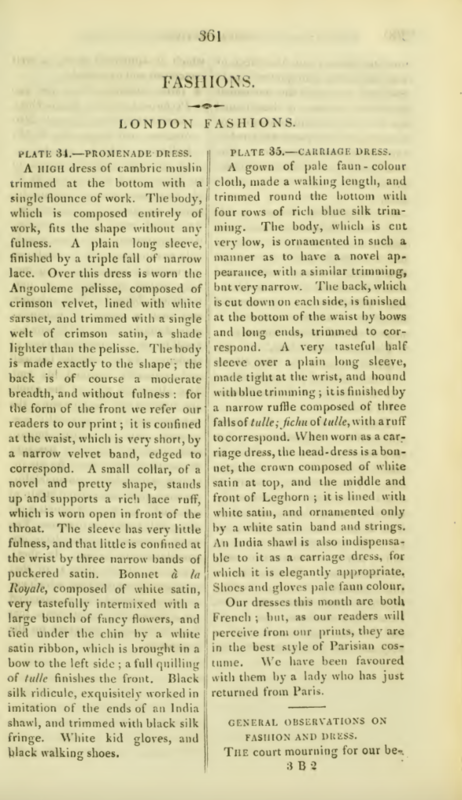 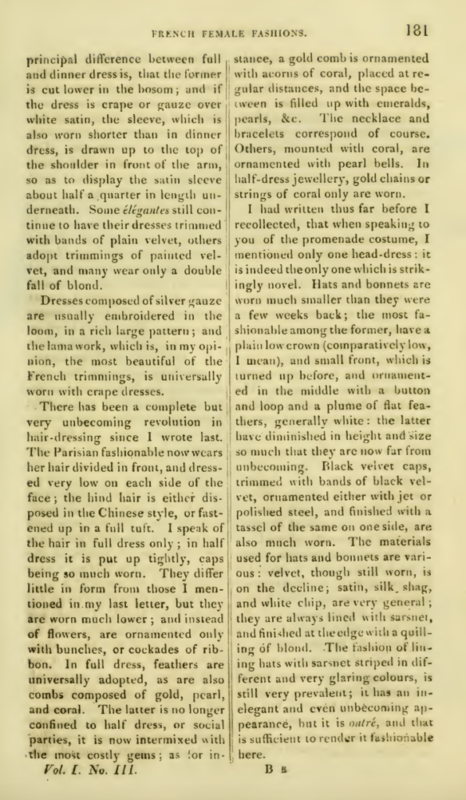 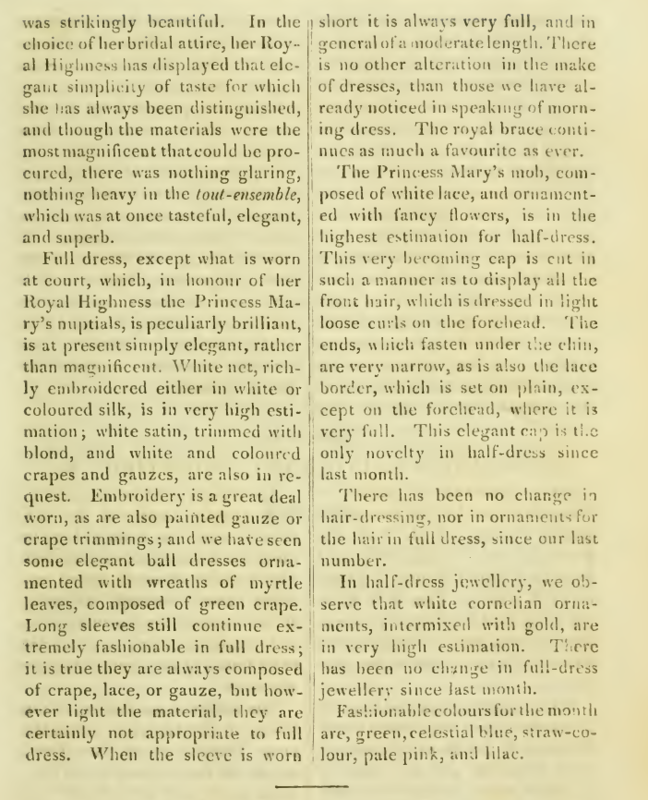 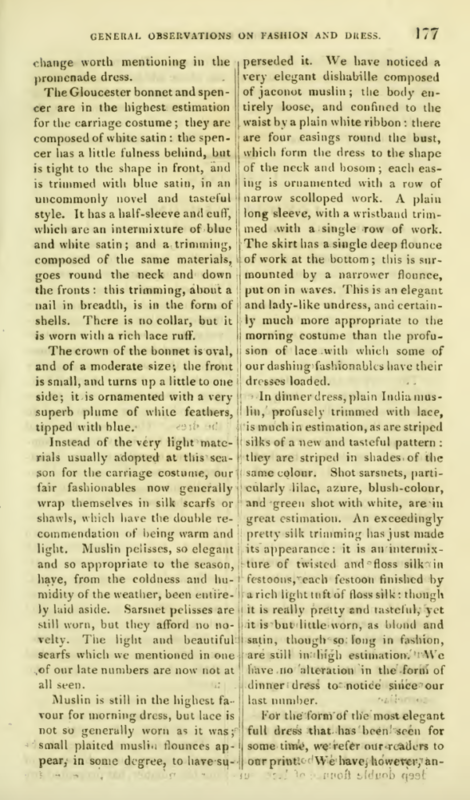 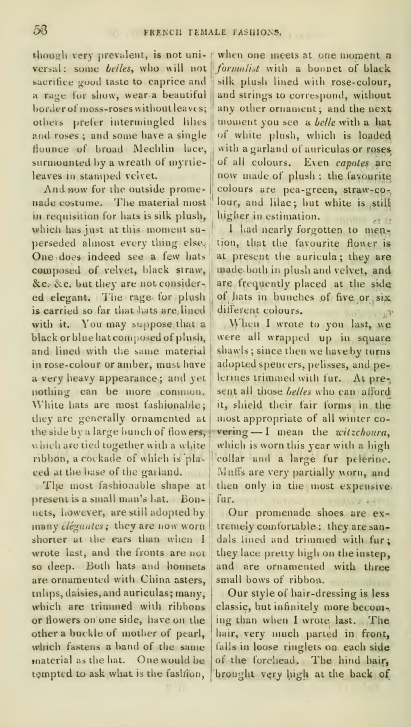 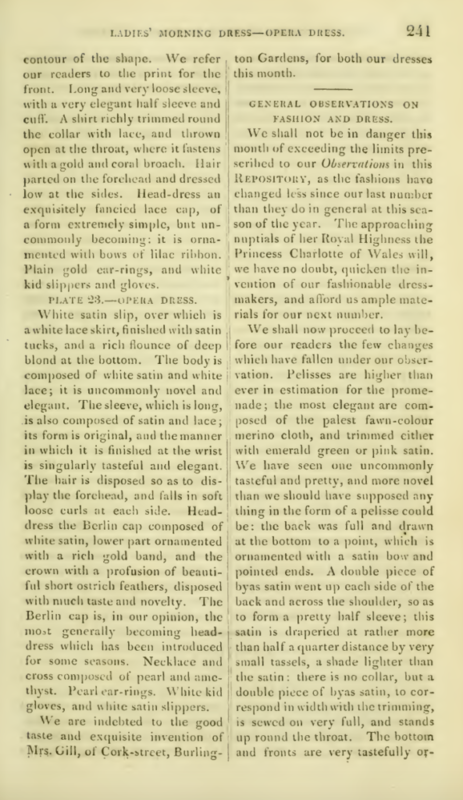 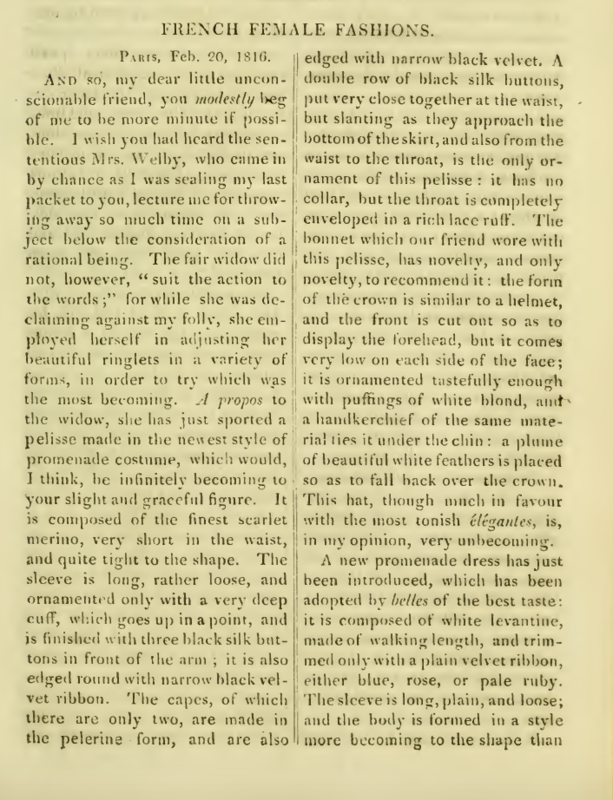 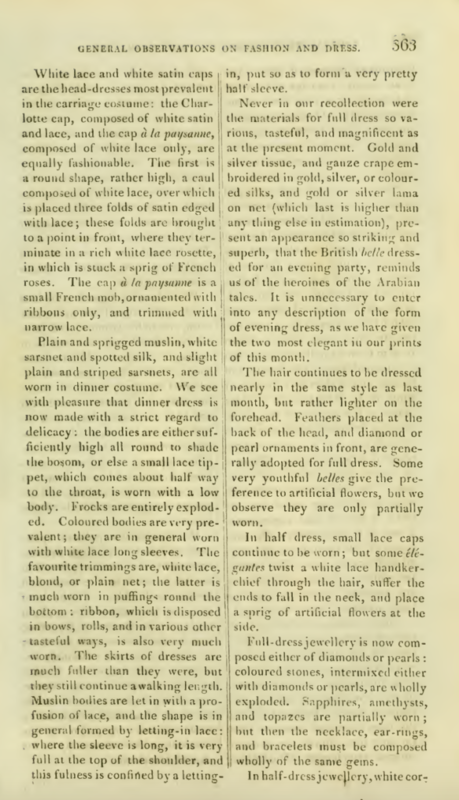 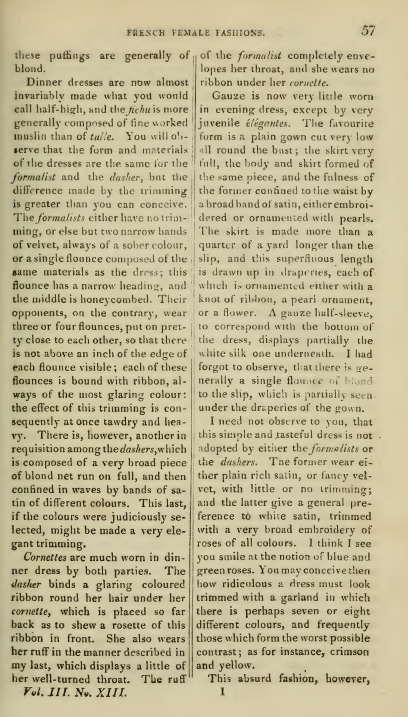 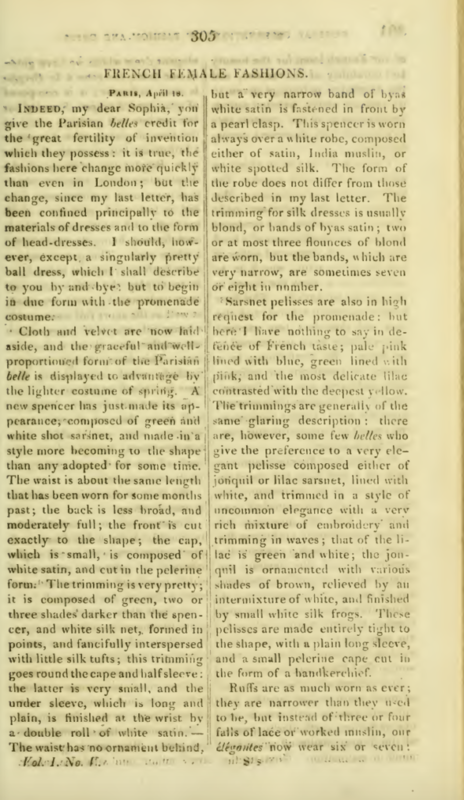 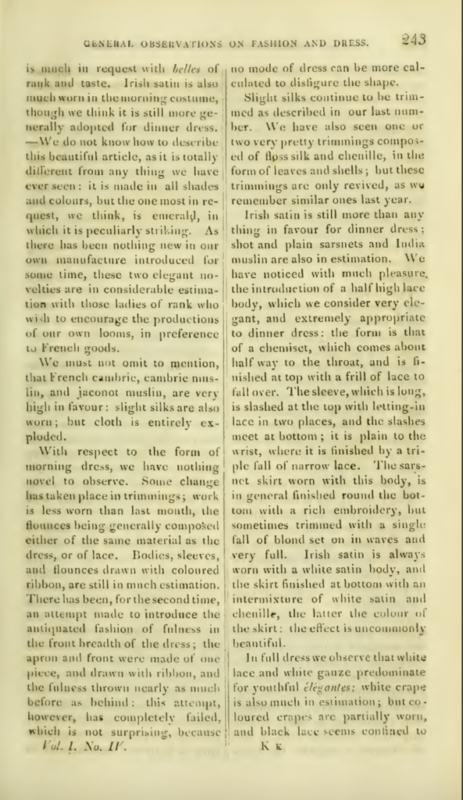 Formalists wear gowns with no trimming at all, or at most two narrow bands of velvet, “always of a sober colour, or a single flounce composed of the same materials as the dress,” while dashers “wear three or four flounces, put on pretty close to each other, so that there is not above an inch of the edge of each flounce visible; each of these flounces is bound with ribbon, always of the most glaring colour.” Needless to say, our correspondent is not at all in favor of this trend (“at once tawdry and heavy”). 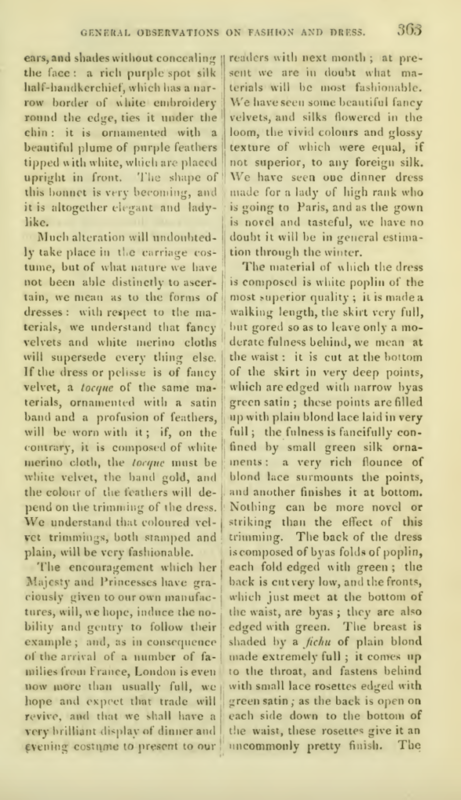 Fashionable colours in Paris include amber, blue, pink, yellow, and scarlet, quite different from those reining in London. 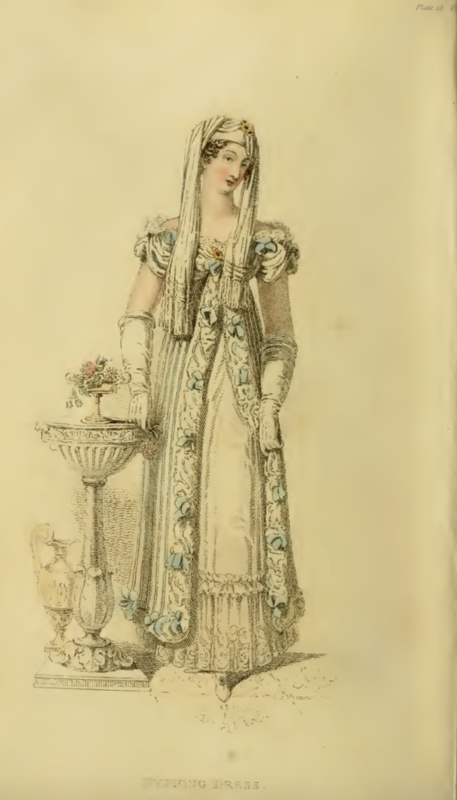 • Carriage costumes still feature scarves, but “the Princess Mary’s bonnet and spencer are higher in estimation.” The princess, eldest daughter of George III, was finally allowed to wed, marrying her cousin, the Duke of Gloucester, in July, only two months after the marriage of Princess Charlotte, daughter of the prince regent. 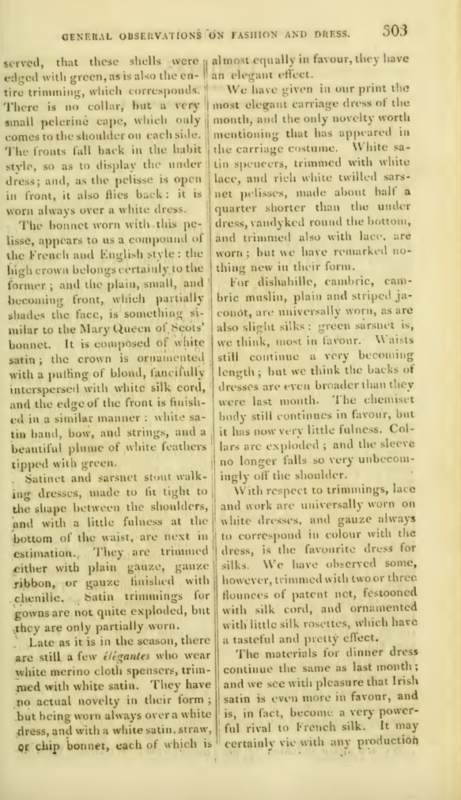 This column includes a description of Mary’s wedding gown.